Darc broke the forum for good? Re: Darc broke the forum for good? Man it's been so long since I've been there. Besides usual forum breaking, is there much going on these days? Uh oh, hopefully it just got hacked? 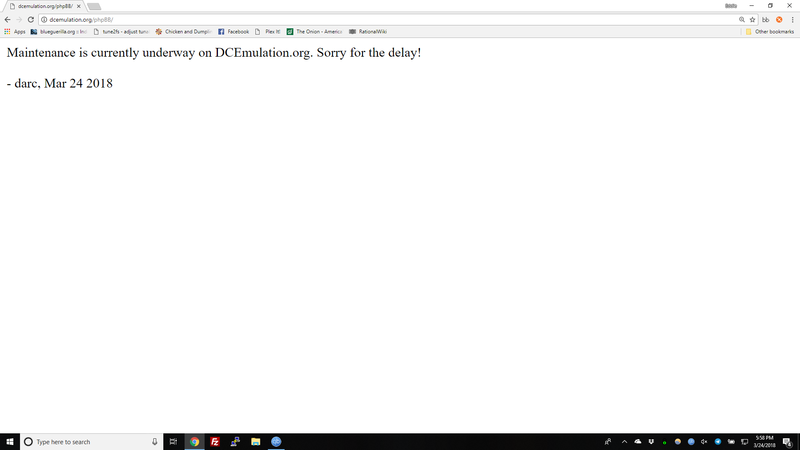 "DCEmulation will be back up soon, sorry!" Skynet wrote: Man it's been so long since I've been there. Besides usual forum breaking, is there much going on these days? Nothing, that place is a ghost town. Page 1 of most of the forums have topics that the last post was a year ago or more. I can't imagine why anyone stays there. Still down. See, that’s what I’m afraid will happen to this place someday. One day I’ll visit like I normally do 3-4 times a day, and it’ll just be down. I’d have no idea how to get ahold of anyone. I almost thought that was the case when the servers started blocking PIA and I couldn’t visit for 2 days. melancholy wrote: Still down. See, that’s what I’m afraid will happen to this place someday. One day I’ll visit like I normally do 3-4 times a day, and it’ll just be down. I’d have no idea how to get ahold of anyone. UPDATE! Darc is unbreaking the forum!